At the end of the 1961 model year, Pontiac’s Bunkie Knudsen went to Chevrolet and Pete Estes replaced Knudsen, with John DeLorean as chief engineer. The stage was set for the muscle car wars. Pontiac’s first entry was the 1962 Grand Prix hardtop sports coupe, which was more of a high-powered personal car, like the Ford Thunderbird. Instead of being a bit more relaxed than the T-Bird, the Grand Prix had a 305-hp, 389-c.i. V-8. Bucket seats, a center console, full instruments, and dual exhausts completed the package. Optional equipment included 8-lug aluminum wheels, and engines all the way up to the 405-hp 421-c.i. V-8. Pontiac sold 30,195 this first year. The 1963 “GP” (as they were known) was restyled bumper to bumper, with smooth sheet metal, a slight “Coke-bottle” shape, and a concave rear window. Sales more than doubled to 72,959, and many buyers upgraded the performance package with 3x2 “Tri-Power” carburetors on the 389-c.i. V-8. With this setup, the engine put out 370 hp and the car could turn 0-60 times of 6.6 seconds with 15.1-second quarter mile runs. The 1964 facelift was slight, but sales stayed strong with 63,810 GPs sold, of which 3,124 were four-speeds. The biggest news this year was Pontiac’s new Tempest GTO, and with that model the entire brand’s performance image was established. The 1965 Grand Prix was heavily reshaped with an even more exaggerated “Coke-bottle” shape, and trim was tastefully applied. Though the GPs were big and weighed over two tons, engines ranged up to a 421-c.i. high-output V-8, which generated 376 hp. With an optional 4-speed transmission available, the powertrains were more than able to handle the car’s heft. Sales dipped slightly to 57,881 as buyers turned to the smaller GTO. 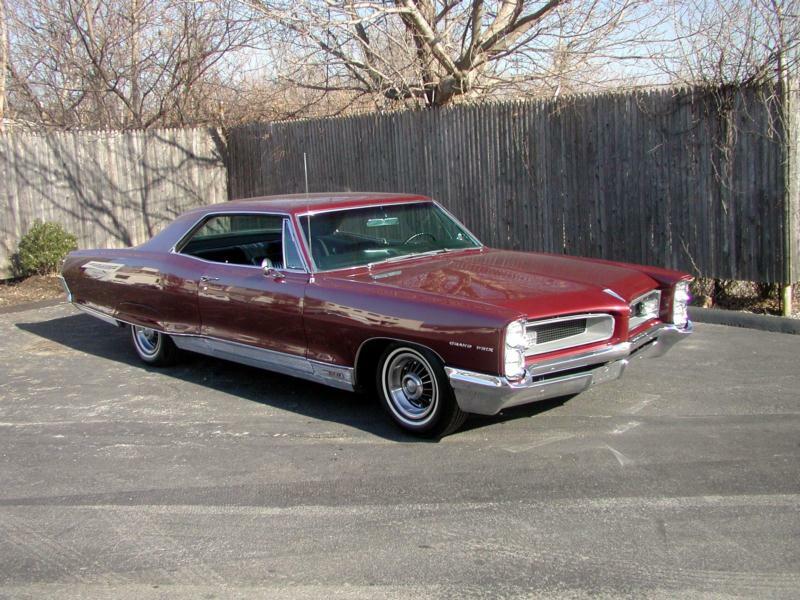 By 1966, big cars were losing popularity and GP sales slid to 36,757. Pontiac was focusing on mid-sized performance cars and the Grand Prix’s makeover was slight. The 1967 revisions were more significant, with a full-width front bumper framing the lower half of the grille, concealed headlights and rear fender skirts. The list of options grew longer and for the only year, a convertible Grand Prix was offered. Only 5,856 were built, which makes them quite collectible today. The last year for this series of Grand Prix was 1968, and the grille was now full-width with a mesh pattern and concealed headlights. The bumper completely encircled the grille, with a prominent “beak” in the center and rear fender skirts were standard. The biggest engine was the 428-c.i. V-8 with 390 hp. Sales dropped to 31,711, but the elegant 1969 model would revitalize the name, and almost four times as many GPs would be sold the next year. Today, the Pontiac Grand Prix is a stylish choice of 1960s car that carries with it much of the eyeball of its GTO counterpart. It is a larger ride and therefore not as spirited of a drive, but especially when paired with one of the more powerful engines, the cars still impart the thrill of a huge American V-8. The one-year-only convertible remains particular convertible due to its low production numbers.